Up to now in North Texas, only the larger cities of Dallas and Fort Worth have been able to boast of having more than one production brewery operating within their borders. That won't be the case for long, though, as Tupps Brewery is nearing completion in the northern suburb of McKinney. Consisting of a 16,000 square foot warehouse and a separate building for office space, Tupps is just two and a half miles from the seven-year-old Franconia Brewing Company. The brewery's physical address of 721 Anderson Street puts it on the grounds of McKinney's historic Cotton Mill, an ongoing development whose standing structures date back to the year 1910. Owners of the Mill site have a long-term plan to bring in future tenants who will join Tupps and an existing Event Hall in creating a multi-use work and leisure destination on the eastern edge of the city. Founders Keith Lewis and Tupper Patnode left high-tech careers to pursue the brewery venture, and from the sound of it they couldn't be happier with their decision. Lewis says he knows the project will come with unexpected twists and turns, but he believes the end result will make it all worthwhile. He envisions a setting where people can come, kick back and enjoy a locally-crafted beer in a casual, family-friendly environment. Along those lines, Tupps will have ample room to entertain. In addition to an outdoor beer garden, at least 6,000 square feet of warehouse space will be devoted to indoor seating and a stage to be built off in one corner. Small-scale musical acts will be able to perform outside as well, set up on a makeshift bandstand created from an elevator platform once used inside the Mill. Such re-use will be a common theme throughout the brewery, something Lewis says is part of a concerted effort to embrace the history of their surroundings. Reclaimed wood from the Mill is being used to build furniture, while hoods of old cars form door awnings and discarded piping is welded into handmade art installations (see some examples in Tupps' online image gallery). One installation in particular will offer visitors a chance to add a very personal touch. A bottle tree is being designed which Lewis hopes will be populated with bottles decorated to honor friends or family members whose lives have been affected by cancer. As for the production area, a 30-barrel brewhouse and a mix of 30 and 60-barrel fermenters will anchor the remaining space, with extra room set aside for future expansions to as much as triple the brewery's opening day capacity. Packaging capability in the form of a canning line is something they see being added later as well, though Lewis says that's probably a year away based on his current way of thinking. Portfolio wise, Tupps currently has five beers in development including a lightly-hopped and easy-drinking Black Ale, which gets an infusion of lactose sugar, and Northbound 75, a specialty pale ale brewed with fire-roasted peppers. 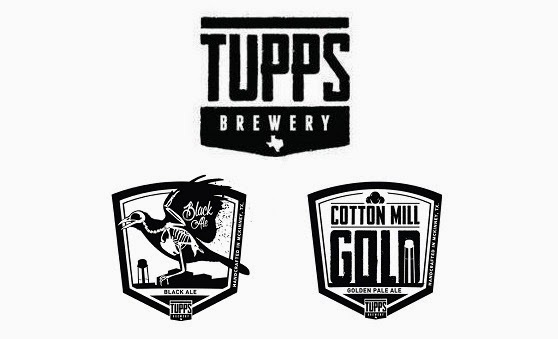 They'll also have beers named Cotton Mill Gold, Texas Centennial Pale Ale and Texas Shade Orange Wheat, descriptions of which can be found on the brewery's website. For now, construction is still very much ongoing, but Lewis hopes to have major work completed along with cleanup done for a formal ribbon cutting in late January. After that, he estimates it will be at least 6 weeks before Tupps is ready to host a grand opening. In a perfect world, that could happen as early as the end of February, but he needs the last of his equipment to be delivered, installed and in full production mode for that to happen. Once it does, the brewery will host regular tours and be open for taproom hours during the week. Stay up with what's happening at Tupps by following the brewery on Facebook and Twitter.